Jane Nérée-Gautier was a French still life artist, who created brilliant harmonious compositions. Characteristic of her paintings is a perfect balance of light and shade, exquisite color combinations and refined textural qualities. Born in Bordeaux on the 20th of November 1877, Jane made her debut at the Paris Salon when she was 28 years old and received an Honorable Mention in 1925. Still life, unlike genre, painting is independent of literary and historical associations and is judged solely on the merits of their visual elements. 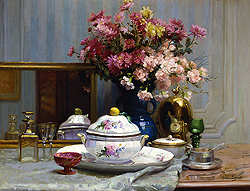 Nérée-Gautier realized this truth and with the use of soft pastel hues and impressionist techniques, she achieved the aesthetic goals of the still life. Delicate and functional household objects of the day assist her in creating a familiar domestic feeling. The elegant arrangement of glowing goblets, shimmering crystal and radiant flowers make a highly decorative and sophisticated composition. Nérée-Gautier was obviously a woman who was not content with the usual portrait rendering of the still life. She was innovative and allowed herself artistic freedom, enabling her to achieve great success as a still life artist.